Great for entertaining, this Bamboo 12“x8” Serving & Cutting Board comes with a Cheese Spreader, Columbia Crest Cabernet, Fiorucci’s Pre-Sliced Italian Salami, Brie Cheese Spread, Elki Crackers, Outrageous Offerings Chipotle Cashews, Zesty Party Snack Mix and Erin’s Popcorn, arranged in a handsome metal tin. 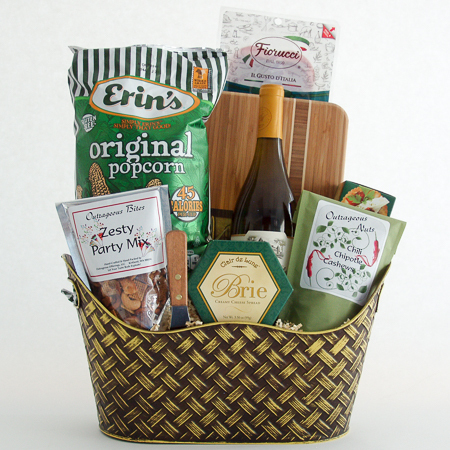 A lovely housewarming gift and realtor closing gift basket. Available with wine, champagne or sparkling cider.